No, it’s not a fly, it’s a fish! And let’s not trivialize that fish because it’s not your average fish. It was not caught in the lake or the sea, in fact it’s not a living fish but a Lucky Iron Fish. 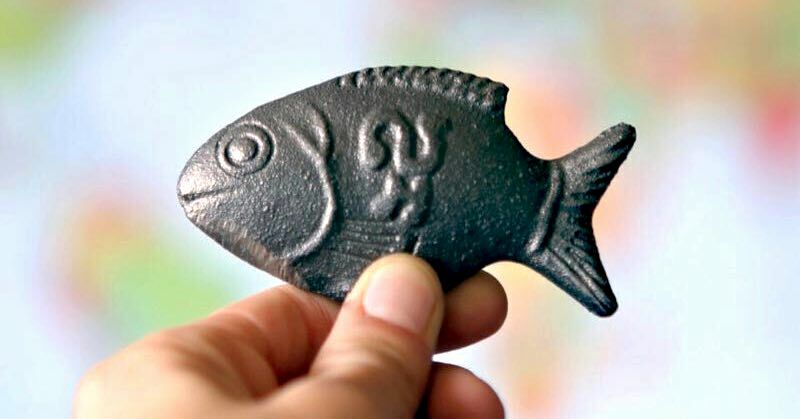 A lump of iron in the shape of a fish that provides essential nutrients to people with iron deficiency. Iron deficiency affects 3.5 billion people around the world. Staggering. This debilitating condition results in weakness, anemia and severe fatigue and is a particular problem in Cambodia where their diet consists predominantly of rice and fish. But who knew there was a simple, effective and low-cost answer to this problem? Once again I am inspired by a young, ingenious entrepreneur from Guelph Ontario who has devised a very simple but very clever way of addressing this problem: The Lucky Iron Fish. Here’s how it works: pop the iron fish in with the cooking water with a bit of citrus juice and boil for 10 minutes. Remove the fish from the pot and then add the rest of the ingredients. Merely boiling the iron fish in the cooking water provides 7-10 mg of iron to the body – that’s 90% of the recommended daily intake. One Lucky Iron Fish can provide an entire family with up to 90% of their daily iron intake for up to 5 years. Blood tests have shown that those who use the fish regularly show a 50 percent decrease in the incidence of iron deficiency anemia and an increase in users’ iron levels after nine months. Such a low-cost, simple, effective answer and, very importantly, easy to incorporate into the daily cooking routine. To date, Lucky Iron Fish has been focused on distribution of the fish to people in Cambodia (the country with the highest incidence of iron deficiency) but their ambition is to PUT A FISH IN EVERY POT and spread the good will of the lucky fish to other countries. And you can help them realize this dream! Buy a lucky fish for yourself (the fish symbolizes luck and hope for Cambodian people, I’m sure it will bring you luck and hope too!) and one will be given to someone in Cambodia. C’mon, it takes all of us, let’s support our Canadian social entrepreneur who is transforming lives in Cambodia. Way to go Lucky Iron Fish. You are helping to address Sustainable Development Goal #3: Good Health & Well-being: Ensure Healthy Lives and Promote Well-being for all at all Ages. Nice to see that a Canadian social entrepreneur has made your list of awesome ideas! Thanks so much for sharing and keep them coming.